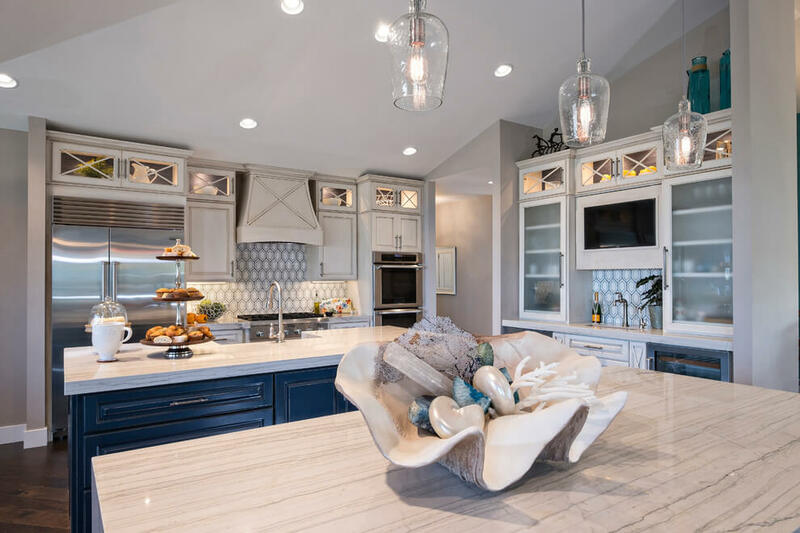 BEACH STYLE KITCHEN IDEAS – You love the ocean so much that you want to include a part of it in your everyday life. And then, voila! 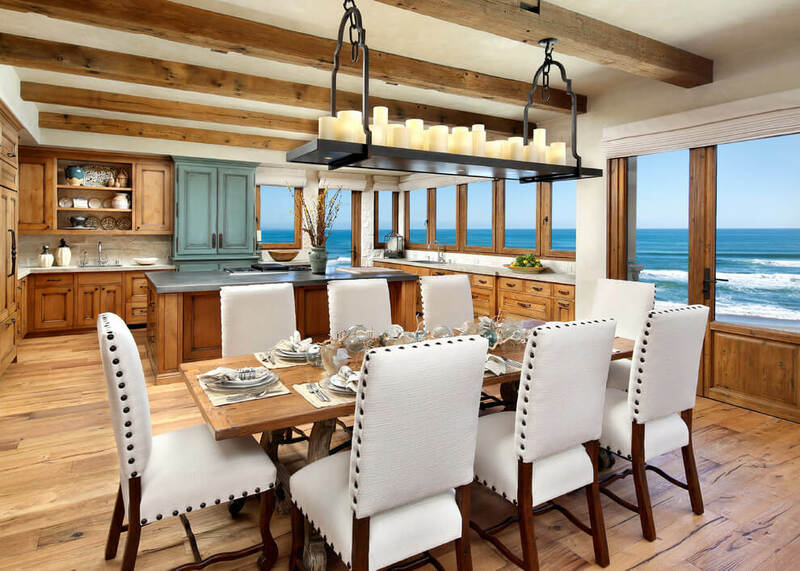 You are looking for functional and also stylish beach style kitchen designs ideas to transform the heart of the house. It seems like a great idea, right? Combining two things you love the most to create a balance, harmonious, and good looking result. 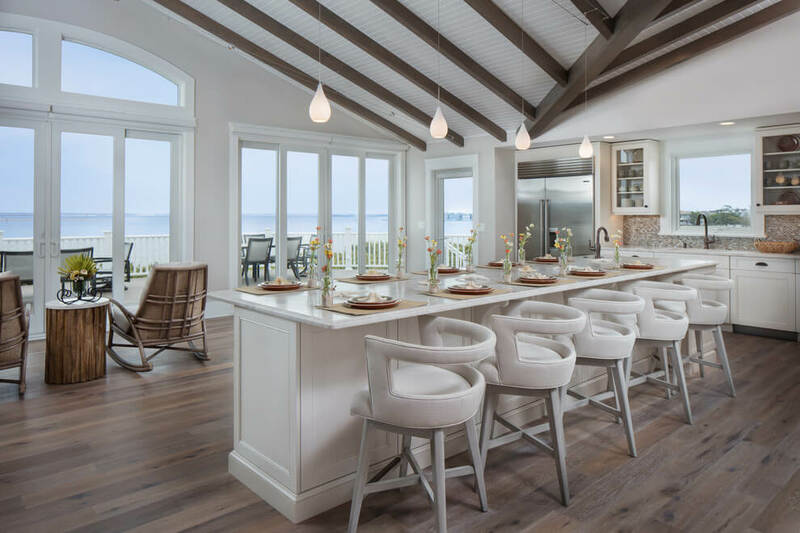 You believe that the coastal atmosphere around you will spark up inspiration while cooking up special meals for your loved ones. 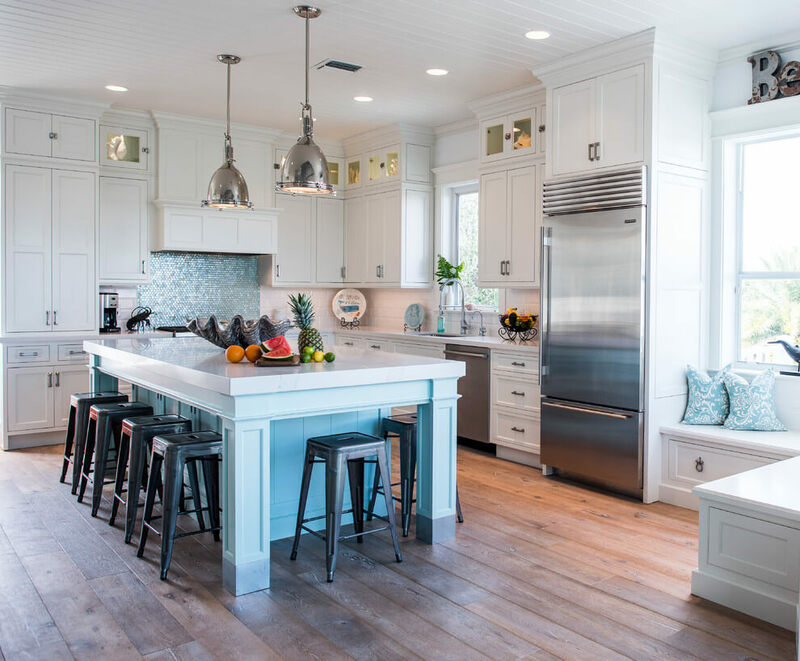 Also known as the coastal kitchen, the beach style kitchen has its own unique signature styles. There are several combinations for this one, mixing up a little bit of rustic, traditional, and also a contemporary modern element. Depending on the location and the homeowner’s preference, the dominating element can be about anything. 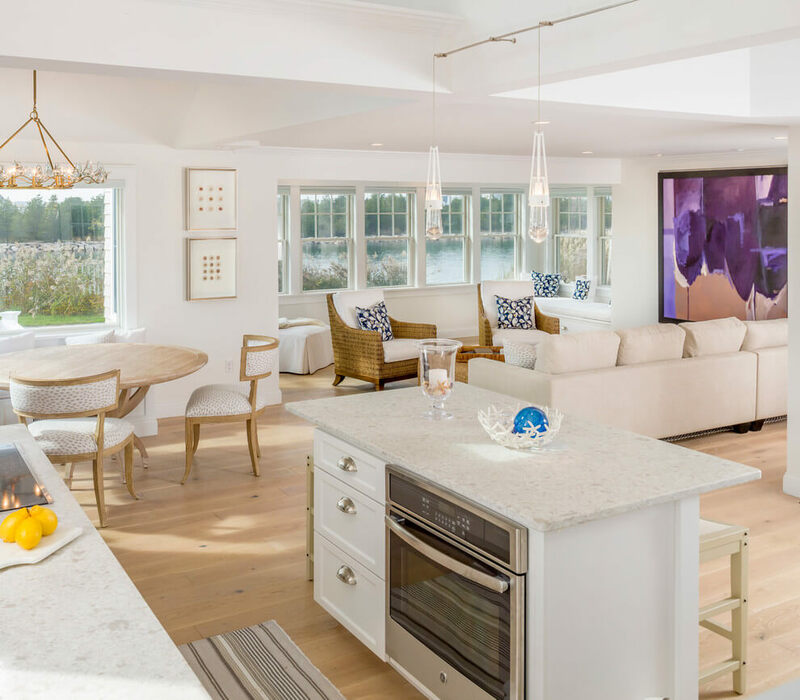 For instance, a seaside villa may come with contemporary modern style, while the home close to a lake may have a more traditional and rustic ambiance. The decision to choose what elements to include in the kitchen decor depends on the owner. Feel free to mix it up the way you like it. 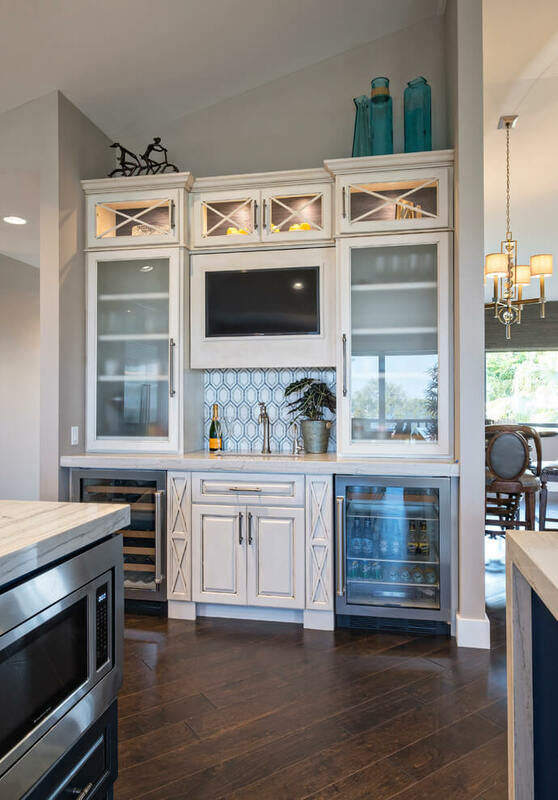 And just because your house isn’t located close to the ocean or to a lake, it doesn’t mean that you can’t incorporate such a style to your home. If you love the theme so much, then go for it! Just remember that the signature style of such design includes wooden frames and light colors – preferably bright colors that resemble the sky, the sands, and the water, like navy, turquoise, or other pastel hues. Naval items for accessories or accents are also common, such as a lifesaver, shells, surfing boards, pebbles and sands, and such thing alike. 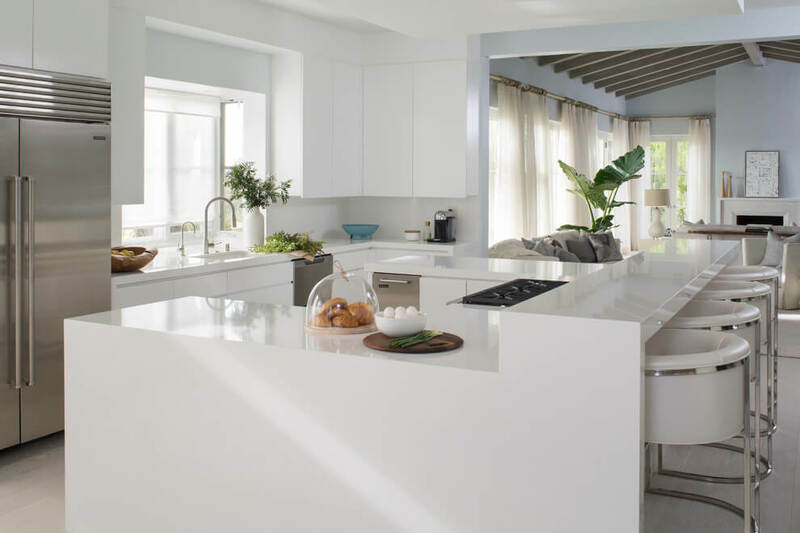 Just because you are going to have a white kitchen, it doesn’t have to be bland or boring. 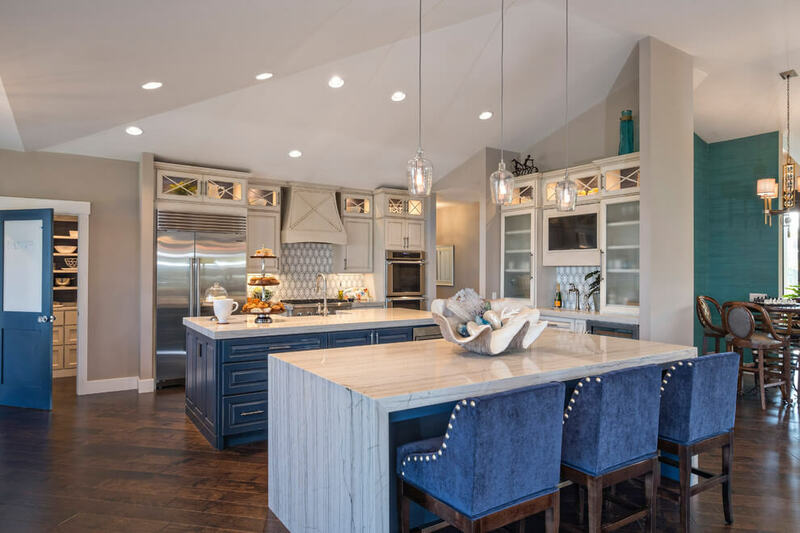 A little bit of creativity and fresh beach style kitchen designs ideas can really make your kitchen look stylish and gorgeous. And you can do it without having to do any excessive attempts. 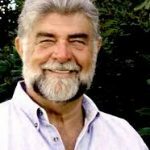 There are some ideas to help you with the design. 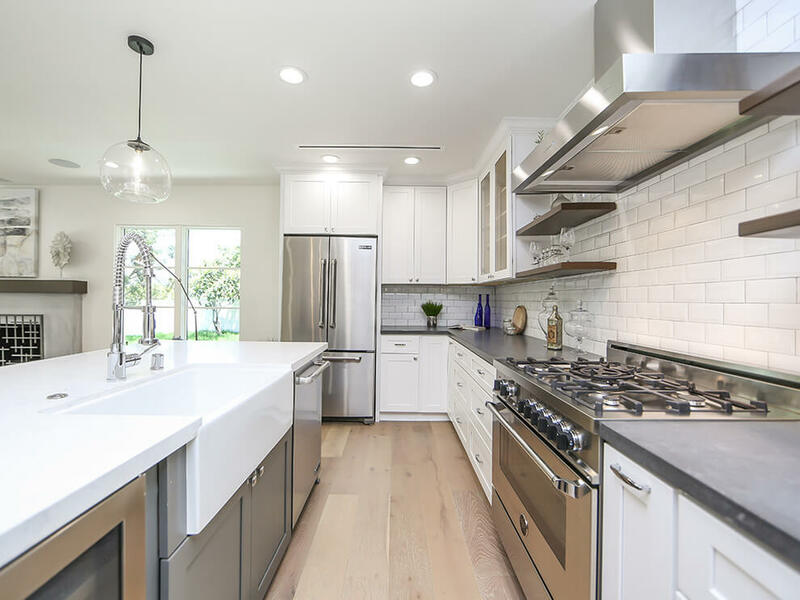 A white kitchen with a combination of colors can make it look appealing. 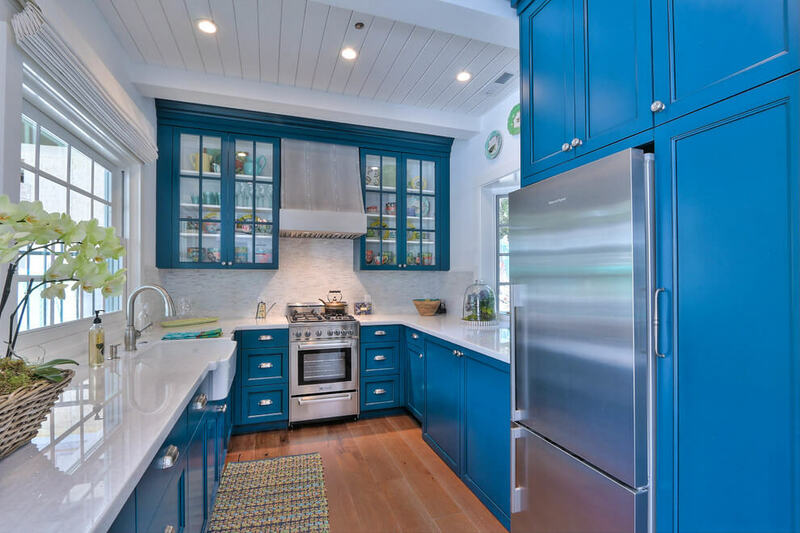 All white kitchen will look different if you add a blue counter or a turquoise stove as the focal point. This is a simple addition that will transform your white kitchen into a stylish spot. If you want to add a more complicated design, you can have a dark wood countertop. Then include blue and white palm wallpaper to create the beachy effect. Add a tropical palm plant on the corner of the room or a potted palm leaves close to the window. Voila! 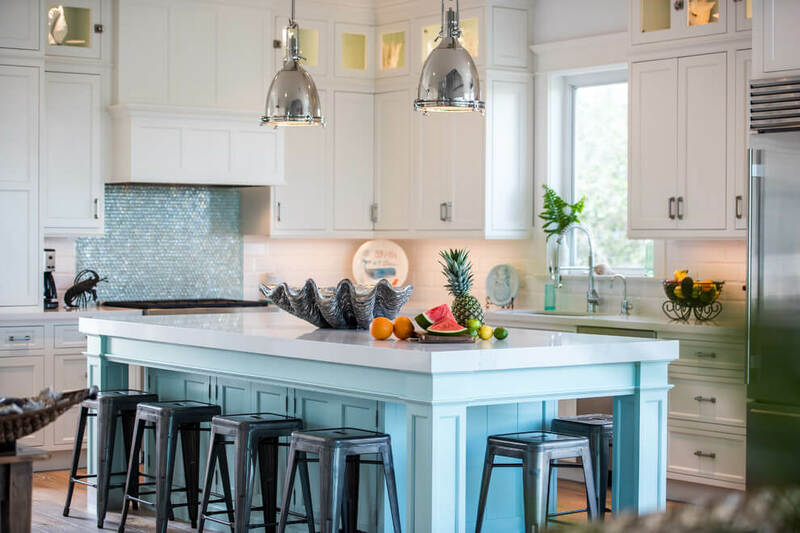 You already have a coastal theme in the kitchen. Adding the color of the sea as well as traditional elements can also make a huge difference. 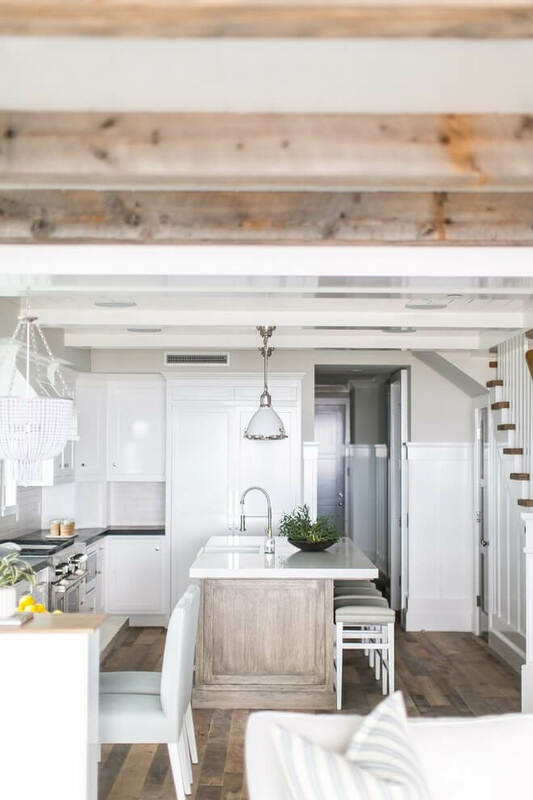 A white kitchen will look more interesting with wooden chairs or wicker chairs. You can have navy wooden chairs paired with a navy chandelier or ceiling lamps. Aqua backsplash for the kitchen counter will complete the whole look. If you can add a glass centerpiece filled with sands or shells, it will be great. 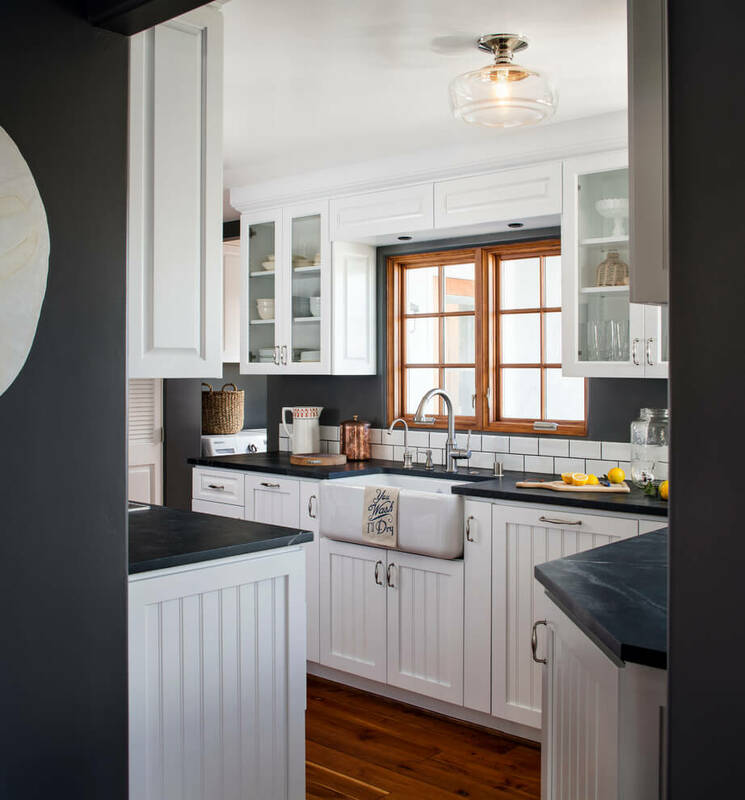 If you have a galley-style kitchen, consider adding some warm and homey elements. Have panel ceiling and walls paired up with some wooden elements. 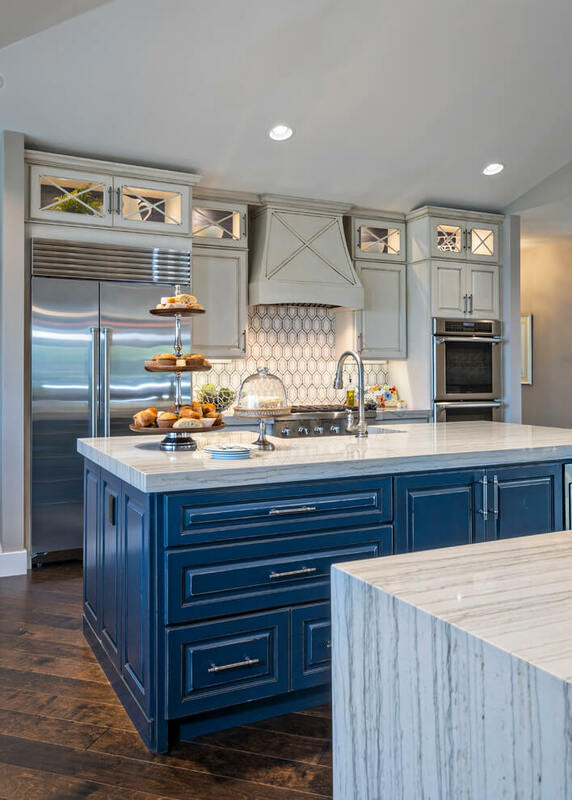 If your kitchen isn’t covered in wooden panels, then choose a focal wall for the panels – you don’t necessarily have to cover the entire kitchen with the wooden panels. 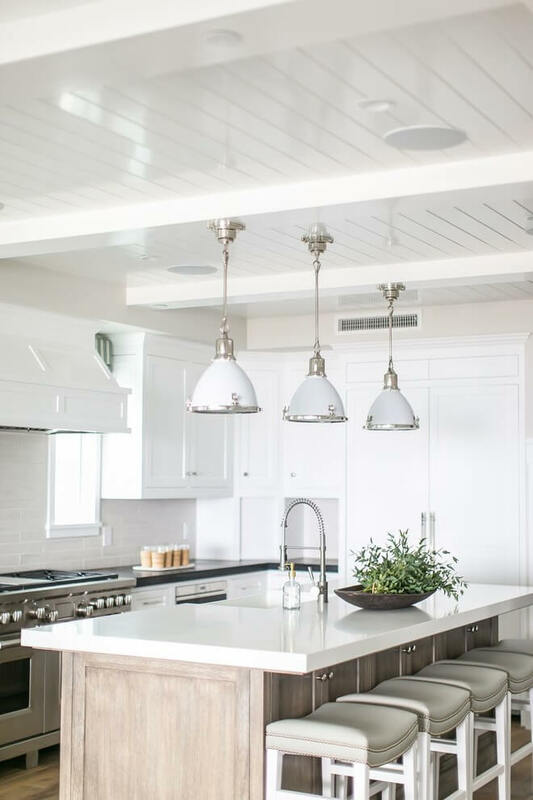 Consider having white, ivory, or cream colors for the kitchen to create a wide and big visual effect. 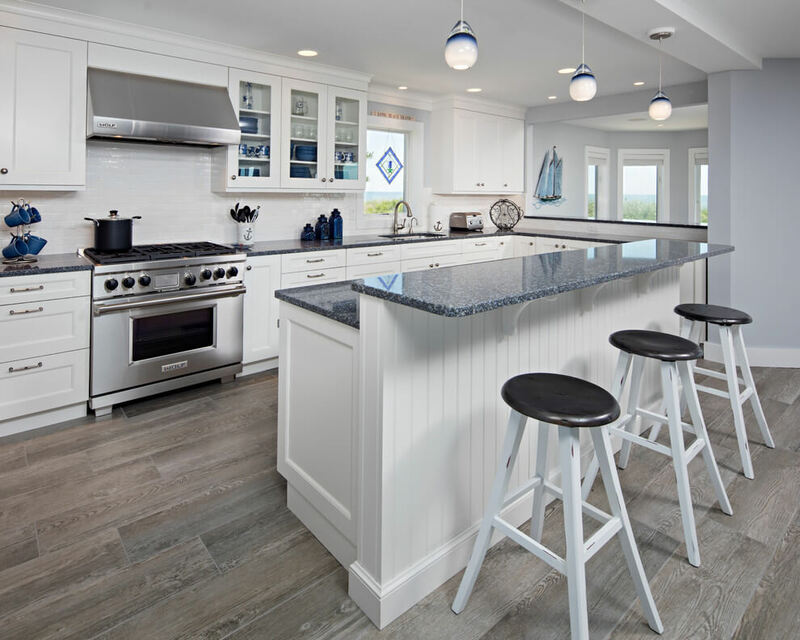 To add some beach effects, add model sailboat on the corner of the kitchen, ipe countertops for the coastal flair, and grass runner to complete the look. 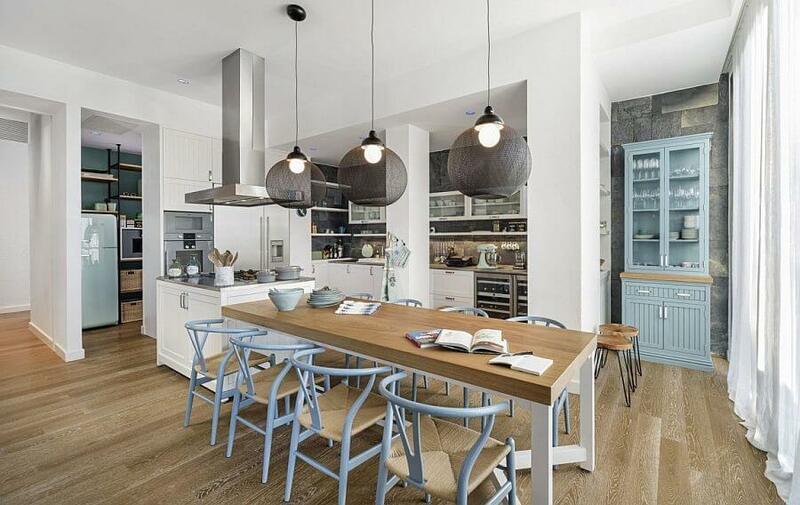 In the event that you want to cover the entire kitchen with wooden panels, be sure to combine the colors carefully. All white panels on the walls will look gorgeous with dark hardwood floor panels. 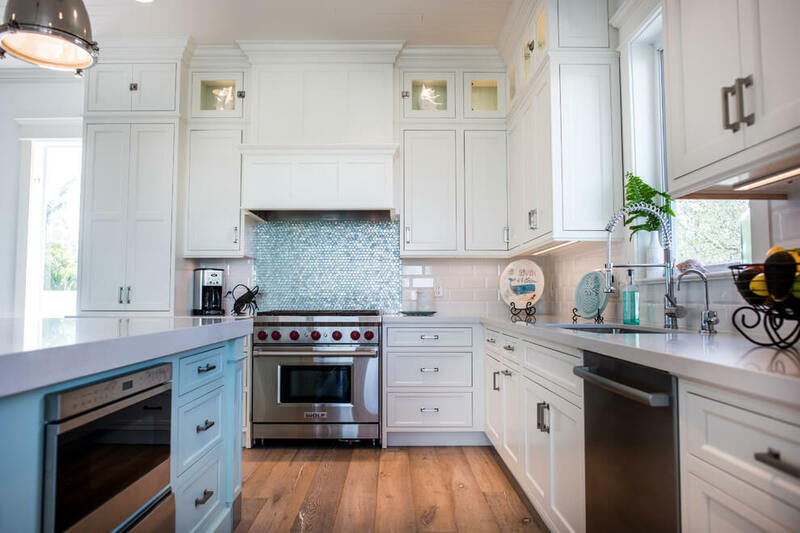 If you want to add a little bit of color, add pale blue or aqua backsplash. 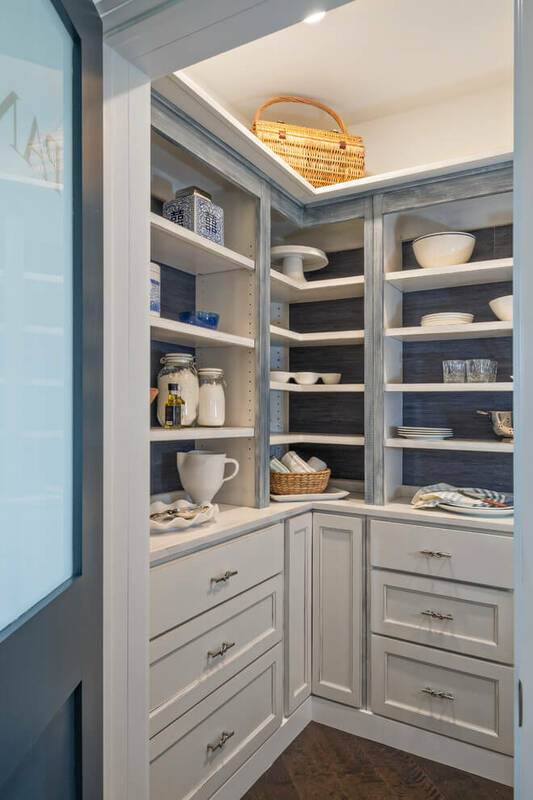 If you have tall ceilings, consider yourself lucky because you can add layers of the open shelf to deliver the beach effect. 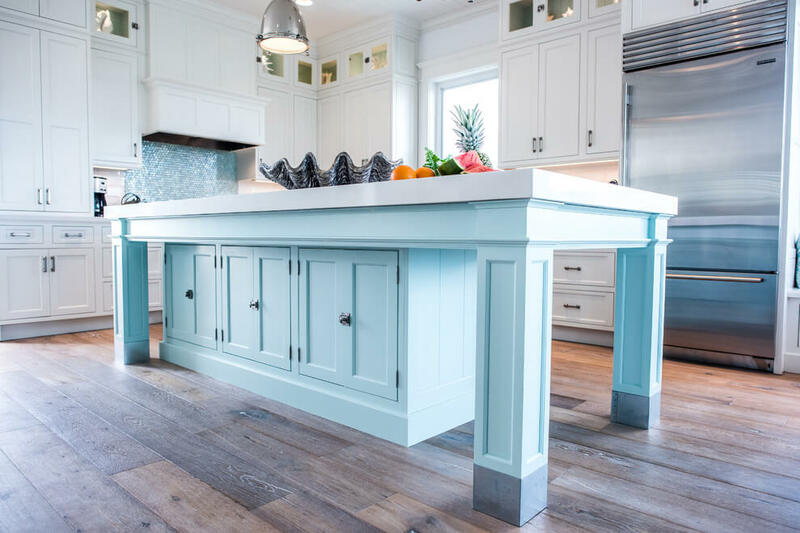 Adding colors to your coastal kitchen isn’t difficult. 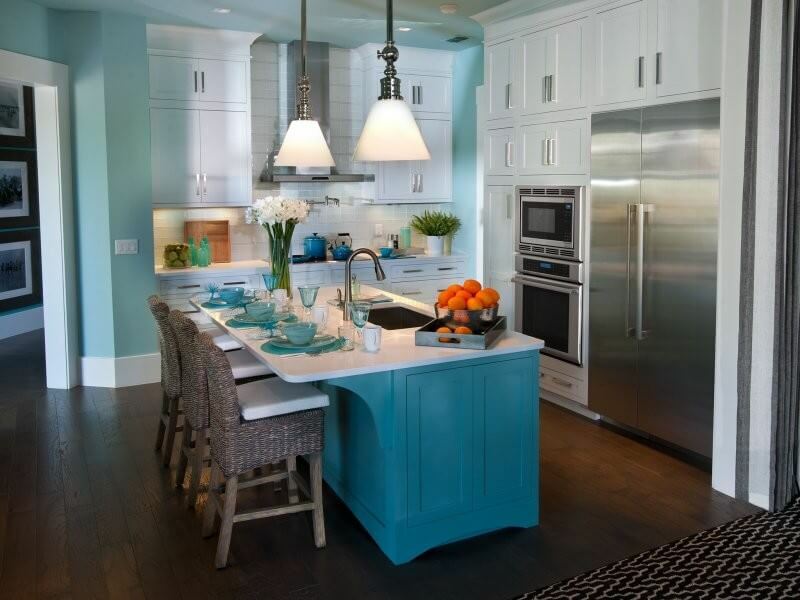 You can have a splash of color here and there – blue kitchen, aqua countertop, dark floor, etc. If you prefer the traditional look, leave it be in its original color. 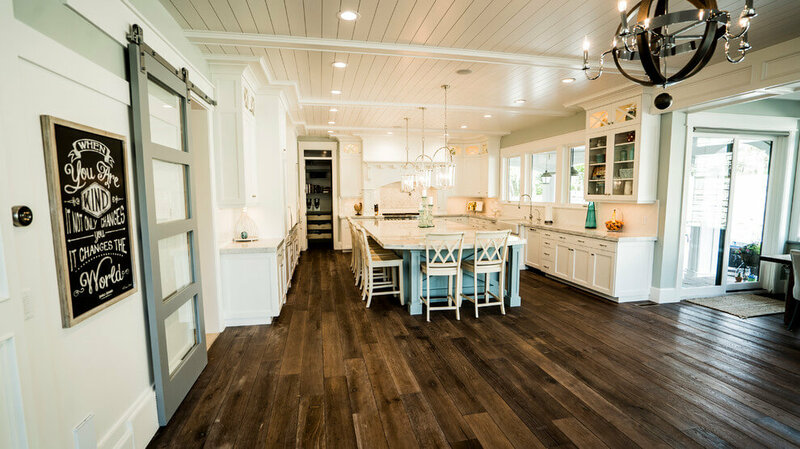 The dark hardwood floor will look great when combined with a light wooden countertop. You can also have bamboo handles or drawer pulls to complete the rustic and traditional look. Basically, don’t be afraid to include colors, but stick to the colors of the sea and waves. 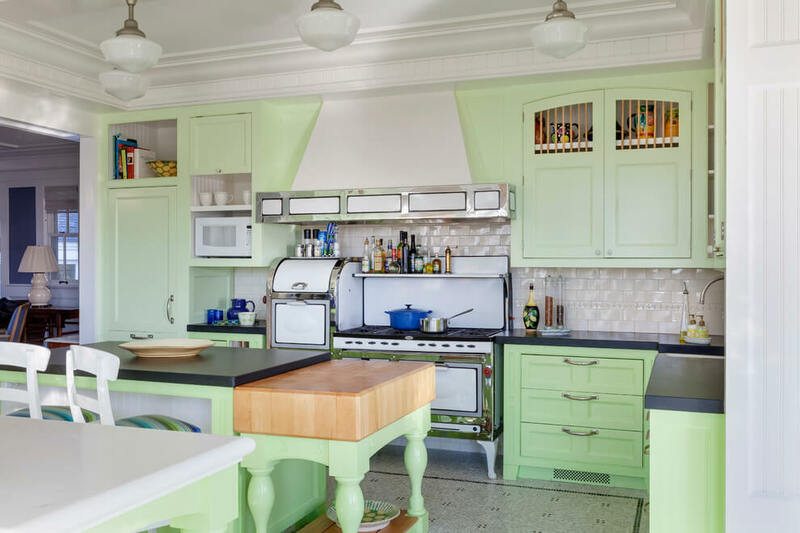 Forget bold and neon purple or bright red – they will look odd in the beach style kitchen. If you can include as many as traditional elements, be my guests. Just don’t overdo it. 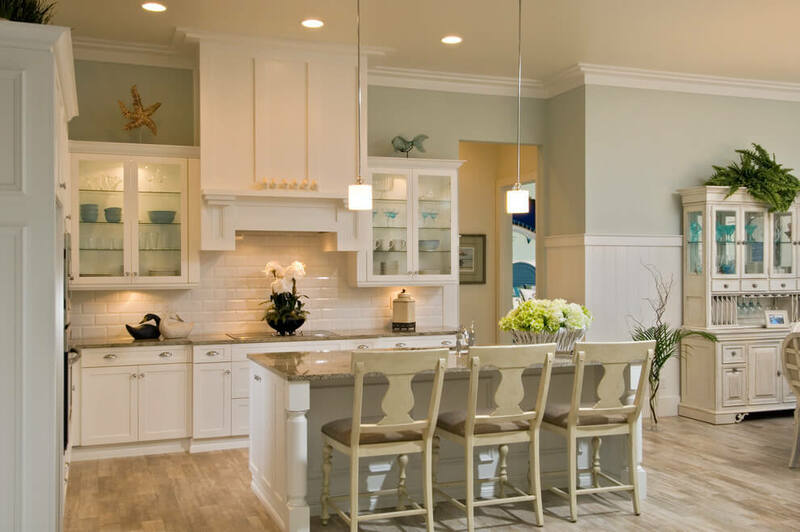 Accessories are the additional elements in beach style kitchen designs ideas. They may be simple but they add accents to the whole design. For instance, striped tools can really deliver the coastal effect, especially if you choose the blue or navy hue. Wall accessories such as anchor decor, washboard wall hanging, or sailboat painting can accentuate the effect. Don’t go overboard with the accessories. Be subtle and keep it light. Add here and there instead of making the kitchen full of accessories. A glass bowl centerpiece with sand and shells on the dining table is gorgeous. 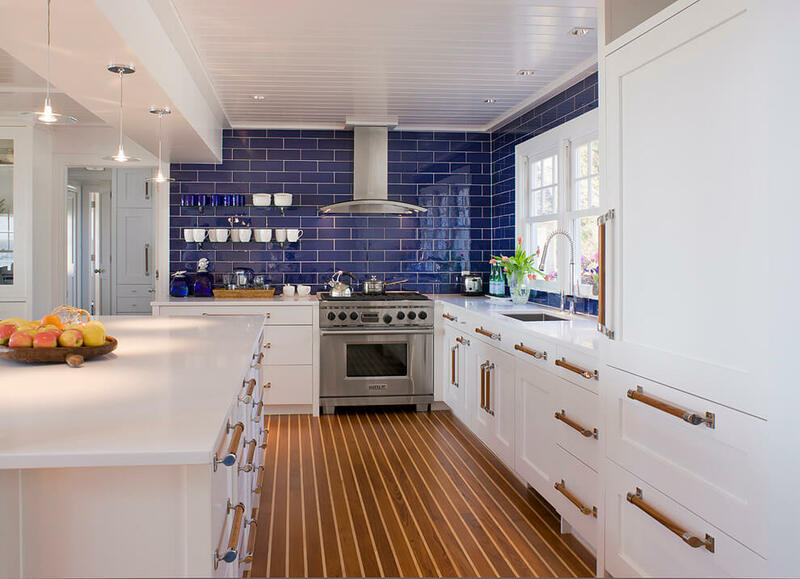 The blue kitchen backsplash with a fish theme is simple and yet attractive. Message in the bottle wall accent is unique and beautiful. 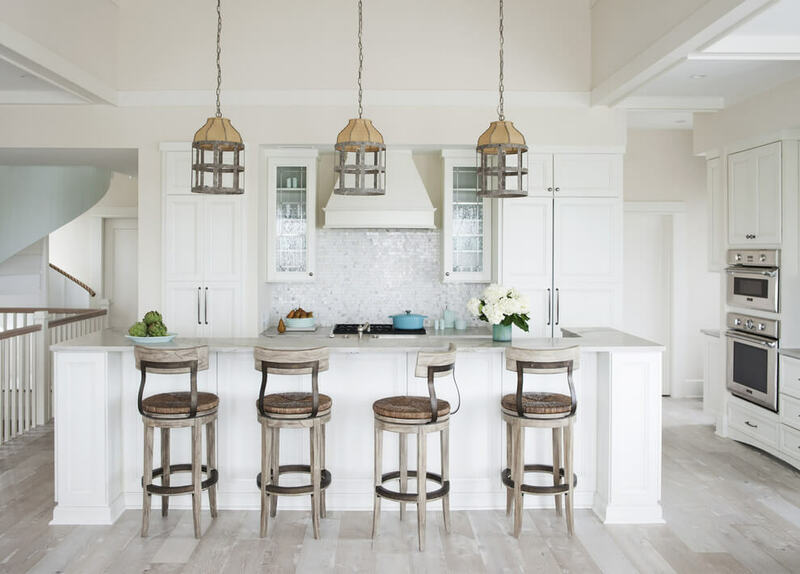 Navy wicker chairs for the dining table or wicker bar stools for the kitchen island will look super stylish. Basically, you can mix up the modern, the traditional, and the rustic as long as you don’t overdo it. Planning a kitchen design can be either tricky or easy. Just enjoy the process. Be sure you know what you want. Don’t overdo and keep in mind that everything has its own proportion. 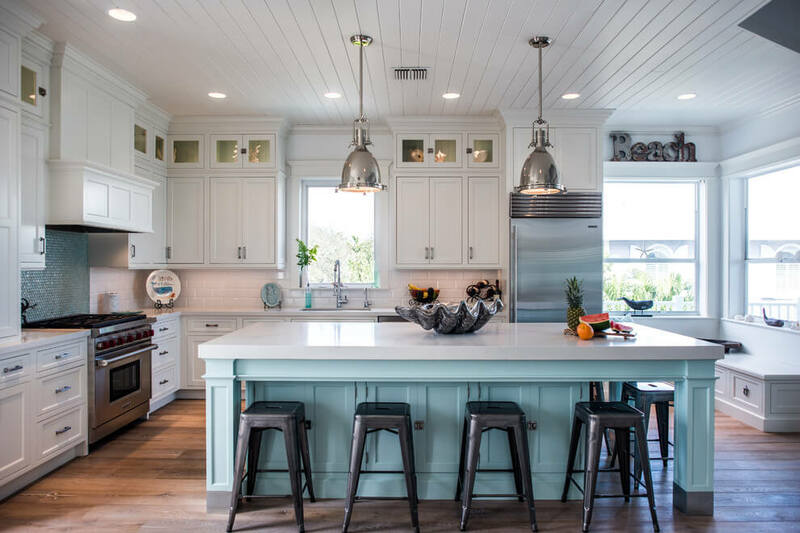 Only by doing so you can mix and match some of these beach style kitchen designs ideas to create a harmonious result. Image From Benson Interiors, Inc. 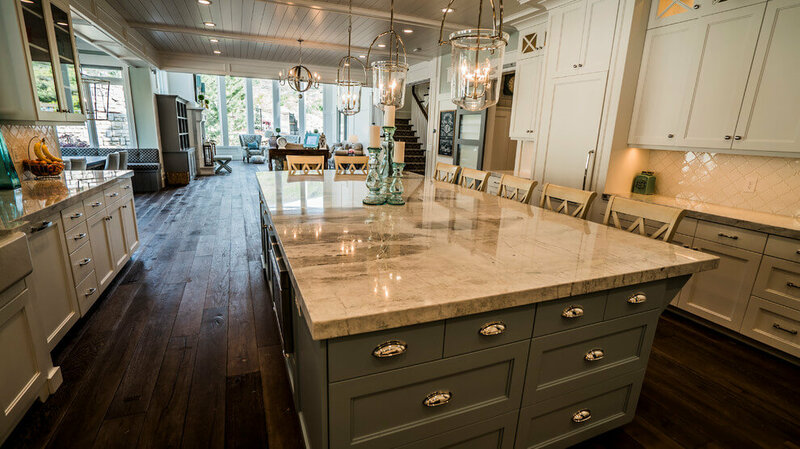 Image From Francie Milano Kitchens inc. Image From Sunset Builders of South West Florida, Inc. Image From Klaybor & Associates, Inc. Image From Mitch Wise Design,Inc.